Ceviche (also spelled as cebiche or seviche) is a citrus-marinated seafood dish originating from the coast of Peru. 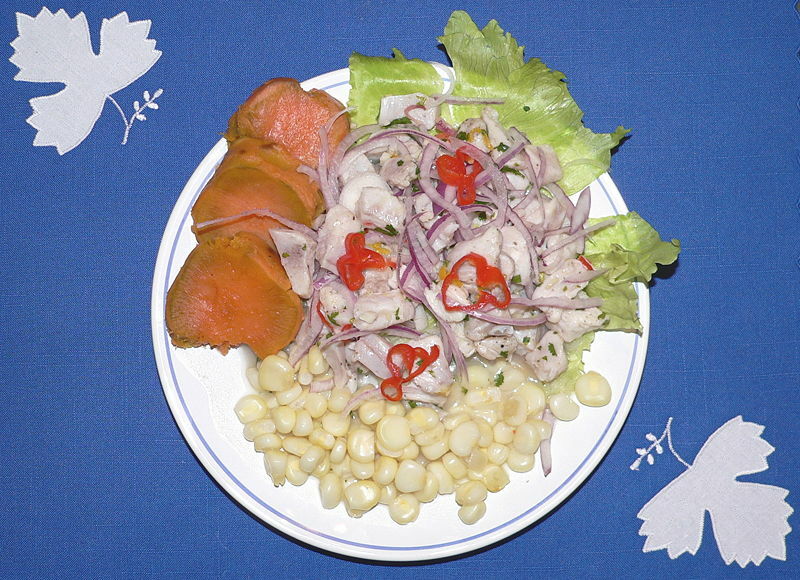 Although it is a typical dish of Peruvian cuisine, many other countries in Latin America have adopted it, albeit, with variations. Both finfish and shellfish are used; finfish is typically used raw while shellfish is typically cooked. Ceviche is marinated in a citrus-based mixture, with lemons and limes being the most commonly used. In addition to adding flavor, the citric acid causes the proteins in the seafood to become denatured, which pickles or "cooks" the fish without heat. Traditional style ceviche was marinated around 3 hours. Modern style ceviche usually has a very short marinating period. With the appropriate fish, it can marinate in the time it takes to mix the ingredients, serve, and carry the ceviche to the table. Every Latin American country has given ceviche its own touch of individuality by adding its own particular garnishes. In Panama, ceviche is served with little pastry shells called "canastitas." In Peru, it is served with slices of cold sweet potatoes or corn-on-the-cob. In Ecuador, it is accompanied by corn nuts, or fried green plantains or thinly sliced plantains (plantain chips) called "chifles". It is also served in a large crystal bowl with the guests helping themselves by spearing it with toothpicks.